What to do? Excluding a close friend or family member from your big day’s inner circle can be a disastrous move for your relationship, but luckily, there are more than a few ways to ensure every VIP in your life plays a VIP (that is, very important part) in your wedding. Here are 10 traditional—and not-so-traditional—ways to get everyone involved. 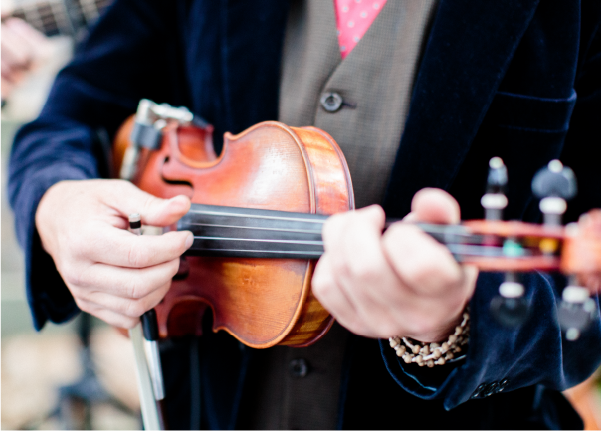 Give the artists in your life an opportunity to shine by sharing a performance with your guests. This could be anything from a song during the processional to an original poem at the reception. Other guests will also enjoy the enter tainment, and the personalized element it brings. Not just for the guys, the role of usher can be extended to both your male and female friends and family members. Honor your aisle-guiding team by asking them to wear special boutonnieres and blooms that match the bridal party’s bouquets. Get the little ones in your life into the spirit of your big day by inviting them to participate in the ceremony. The ring bearer and flower girl can attend bridal-party fittings for miniversions of the outfits your groomsmen and bridesmaids will be donning. And they'll definitely feel like stars of the show when your guests are oohing and aahing over their adorable walks down the aisle. 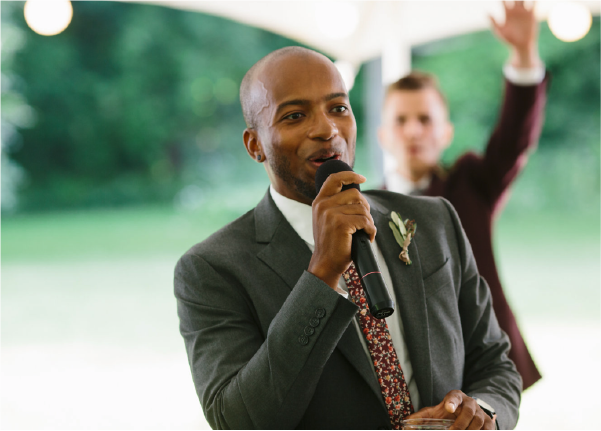 Asking someone to give a speech during the reception will not only make them realize how important they are to you, but it will also give them the opportunity to share memories and anecdotes with the rest of the guests. Alternately, if you are planning to make a toast yourself, a few thoughtful shout-outs will make those who have played a big role in your life feel like wedding-day rock stars. Perhaps the greatest way to honor someone close to you is to ask him or her to be the officiant at your wedding ceremony. It will make the day extra-special for everyone, and will forever be a part of your story. Another option is to have someone other than the best man and maid-of-honor sign as witnesses on the official marriage certificate. While bridal party members may get to walk down the aisle, other special guests can partake in the ceremony by reading poems, excerpts, religious verses, or original works. This adds a personal touch to the wedding, and gives the readers a special responsibility on the big day. Bestow your most outgoing and amiable friend or family member the important job of ensuring your guests sign your guest book. He or she will enjoy making the social rounds at your reception; you’ll get an amazing keepsake full of well wishes from all of your nearest and dearest. Having an extra pair of hands or two for crafts and tasks-whether it is addressing envelopes or stuffing favors—will ease your pre-wedding workload, but it will also make for bonding time with the family and friends who want to share in your big day. Make an evening out of it and invite a special non-bridal-party group over for a movie, drinks, and some DIY. 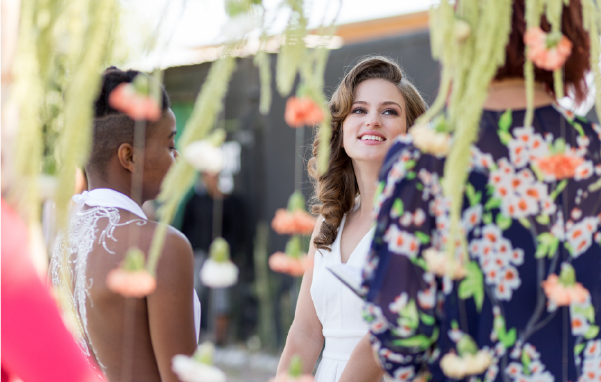 Pre-wedding gatherings—from the bachelor and bachelorette parties to the bridal shower and rehearsal dinner—are smaller-scale events that allow you to widen your inner circle to include more than just your bridal party. Inviting in-laws, friends, and more distant relatives like cousins, aunts, and uncles is a great way to make them feel like an important part of your big day. Cover your bases by creating a wedding slideshow that features all of the key people in your life. Whether it is a picture of your aunt holding you as a baby or a group shot of friends with the happy couple, a photograph in the slideshow can be an exciting surprise for those who are included.